I am beyond giddy as I write this itinerary. I haven’t been back to New Orleans since I moved last May and my heart has been aching to return! I will have two of my best friends, two lovely gentleman and my sister in tow. I can’t wait to introduce them to the amazing atmosphere of this city during Mardi Gras. I have yet to discover anything like it. When it came to coordinating schedules, a visit from Thursday to Sunday made the most sense. I insisted on Thursday. It’s my favorite evening of parades and it gives you the last sense of what the local Mardi Gras feels like before the parades get insanely crowded by incoming visitors. 1 BEIGNETS // I’ll arrive Thursday morning or Wednesday night because the Muses parade is my favorite. It’s the one that makes me feel like Carnival is really kicking into high gear. After checking into my parade route rental, I plan to grab a taxi to the Quarter. First stop is Cafe Beignet on Royal St. for beignets and chicory coffee. 2 JACKSON SQUARE // Wander over to Jackson Square while it’s still early and check out all the street art hanging outside. There are plenty of fun shops along Royal and Decatur to stop in along the way. You may be lucky enough to catch the street musicians (like Tanya and Dorise who’ve I’ve seen many times and finally found the link for on Upperlyne) if the weather is nice. 3 ST. LOUIS CATHEDRAL // Climb the steps to the right of Cafe Du Monde for an iconic photo of the St. Louis Cathedral, before walking behind Cafe Du Monde (and it’s insanely long lines) to get a view into their kitchen and see how beignets are made. Continue on until you reach the French Market where you could easily spend an hour exploring. 4 CAJUN CUISINE // Stop at The Grill for lunch before wandering towards Bourbon Street. It is going to be crazy this time of year, but c’mon, you’ve got to see it! Stop for a drink here or simply explore all the little side streets. Peak into Pat O’Brien’s dueling piano bar when you spot the sign. 5 HAPPY HOUR // Head to SoBou for an early happy hour before catching a cab back to my rental in the Garden District. 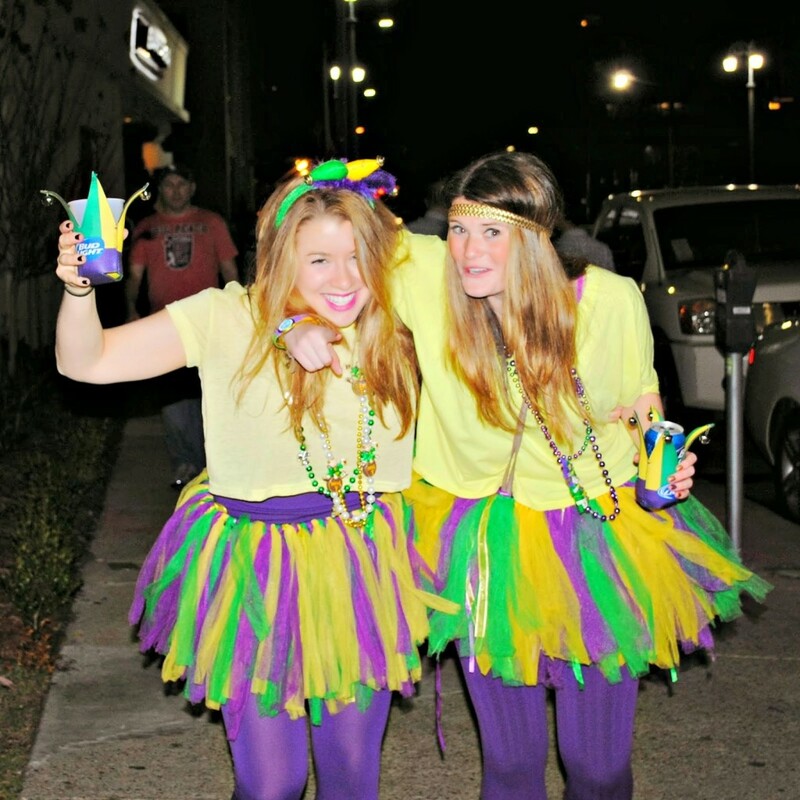 6 DINNER + PARADES // Walk to Juan’s Flying Burrito for dinner and grab a frozen mojito in a go cup before we head to Jackson and Magazine for the parades. Tonight is the all-lady Krewe of Muses, if you’re extra nice and can catch someone’s eye you may also end up catching a glitter high heel throw! 7 LIVE JAZZ // Catch a live band on Frenchman Street to end the night. Fun spots include the Spotted Cat Music Club and d.b.a. There’s just as much character on the streets as there is inside. 1 BREAKFAST AT STEIN’S // Wake up and walk to Stein’s for a bagel sandwich and coffee. I may even spring for an extra fancy donut from District next store after I polish off my bagel. I’d be shocked if they didn’t have king cake donuts! 2 SHOPPING MAGAZINE // After breakfast is the perfect time to wander down Magazine for a peak into all the fun shops. Some of my favorite local boutiques include Fleurty Girl, Defend New Orleans, and Storyville. I also like to browse Hemline, Funky Monkey, Magpie (where I got my Nola necklace) and the Magazine Antique Mall. 3 PO-BOYS // Stop to have po-boys for lunch at Guy’s in Uptown, Mahony’s in the Garden District or Parasol’s in the Irish Channel. Who has the best po-boys? That depends on who you ask… If you prefer something fancier give the French-inspired Lilette or innovative southern cuisine at Coquette a try. 4 HISTORIC GARDEN DISTRICT // Explore the historical homes of the Garden District (see this walking tour for help) or maybe check out the Lafayette Cemetery No. 1 across from the iconic Commander’s Palace that boasts 25 cent martinis with lunch. 5 DINNER + PARADES // Dinner at Charcoal’s for a unique burger or Dat Dog for deliciously filthy cheese fries and hot dogs piled sky-high with toppings. If the weather is nice we will sit outside Dat Dog and sip on a few drinks before walking over to St. Charles for the parades. After parade drinks at Les Bon Temps. 1 BRUNCH // I have received so many recommendations to eat brunch at Atchafalaya. If we wake up with time to spare, I may have to give it a go. Surrey’s is another go-to brunch spot in the area. 2 PARADES ON PARADES // After brunch, I’ll get decked out for a full day of parades. Saturday is my favorite day to throw on an outrageous costume before hitting the streets. We’ll walk along St. Charles to catch the end of Iris and Tucks as we make our way towards Poydras and Tchoupitoulas (chop-a-too-las). 3 BAR HOPPING + GO CUPS // Along the way we will stop at Lucy’s Retired Surfer’s bar for a margarita because they’re delicious and they come with cute little plastic mermaids floating on the side. This bar always makes me nostalgic because I stayed at the hotel across the street when I first moved to New Orleans. If Lucy’s isn’t what you’re looking for, try W.I.N.O. or Barcadia. Don’t forget New Orleans has no open container laws so you can always ask for your drink in a go cup and enjoy it on the walk. 4 DINNER + BOURBON // Dinner? There are a ton of delicious restaurants like Emeril’s, Cochon and Peche in this neighborhood, but let’s be honest, by this point it’s highly likely I will be on a liquid diet. We will eventually catch the Endymion parade near Lafayette Square (even though it starts at 4:15 pm, it won’t make it to Lafayette Square for awhile… you can download the parade tracker app to stay informed). After the parade we will catch Rebirth Brass Band at the Howlin’ Wolf. Later we might even brave the crowds of Bourbon to sing a little karaoke at Cat’s Meow. And this is where I leave you. I have work to get back to in DC and an unfortunate 5:00 am flight to catch! If you are lucky enough to stay for Sunday, Monday and Tuesday you can find the rest of the parade routes here. Most celebrations stop at midnight on Tuesday so don’t expect parades on Ash Wednesday. 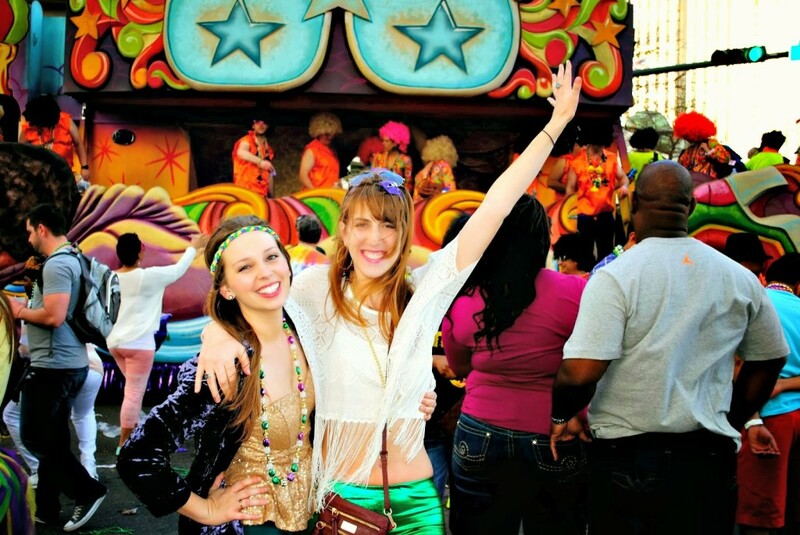 Have you ever been to NOLA for Mardi Gras? Did I miss one of your favorite spots? 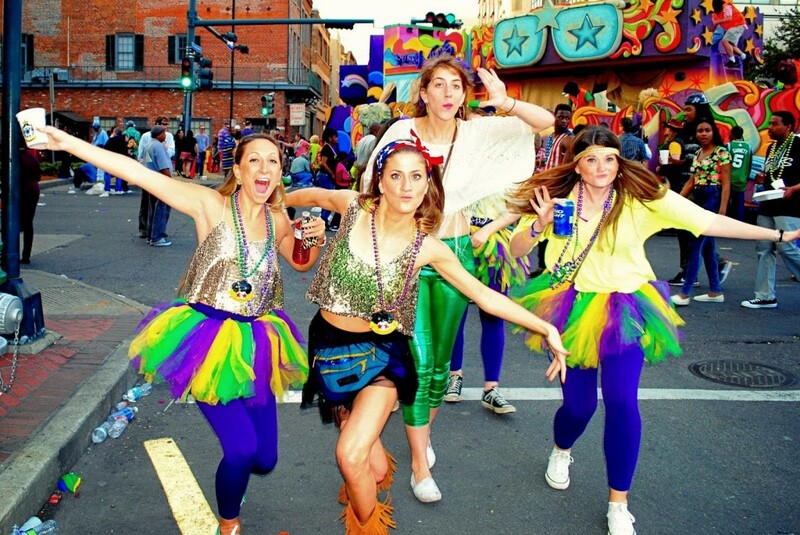 For an alternative itinerary that takes you exploring some of the lesser known and more debaucherous aspects of Mardi Gras, read this.